SF Bay Area Solar Spray Foam Roof Wins Best Nationwide Award. 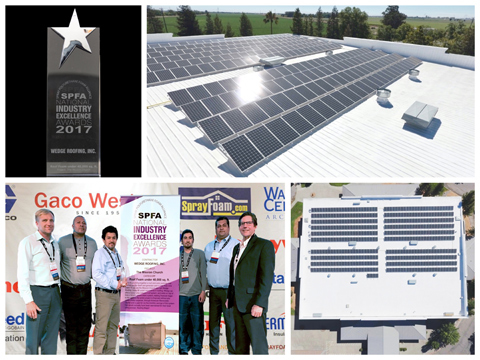 A Solar Spray Foam Roof installed by San Francisco Bay Area Contractor, Wedge Roofing was selected as "Best in the Nation" by the Spray Polyurethane Foam Alliance (SPFA). The SPFA announced the winners of the 2017 Spray Foam Industry Excellence Awards at their 12th annual Awards Gala in Palm Springs. For the third consecutive year, Wedge Roofing won the First Place Award for Best Spray Foam Roof Nationwide under 40,000 sq. ft. In this national competition, industry leading spray foam roofing projects from across the country were judged independently by a panel of experts, based on Value for Money, Speed of Delivery, Environmental Sustainability, Innovation, Best Practices, Problem Solving, and Risk Mitigation. The award-winning solar spray foam roof system converted reroofing capital outlay into income generation for The Mission, a non-denominational house of worship located in Vacaville, California. Custom designed by Wedge Roofing, this roofing project combines the benefits of a High-Performance Insulating Spray Foam Roof with the cooling effect of a Reflective Roof Coating and the energy generation of a rooftop solar system, resulting in an energy-efficient roof system that will pay for itself in utility savings. The high-end Accella Brand Premium Spray Foam Products Roof installed by Wedge was paired with an equally high-end 163kW Photovoltaic System from Westhaven Solar for a seamless roof installation and solar system integration. The pairing means both systems work at peak efficiency, the solar system safely and securely implemented over the energy-efficient SPF roofing system. The Spray Polyurethane Foam Alliance is the voice and educational arm of the polyurethane foam industry. SPFA delivers training, industry certification, leadership on energy conservation, the environment, health & safety, building codes and technical advances in the industry. Members are professional contractors, manufacturers and distributors who strive to educate, regulate and improve the trade. Great experience with Wedge. House looks GREAT and I feel confident because they guaranteed and stand by their work. Highly recommend.